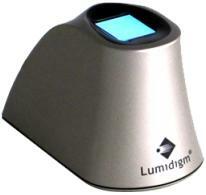 Multispectral imaging from Lumidigm is a biometric technology that virtually eliminates common real world performance problems experienced with conventional fingerprint sensors. Robust and reliable, multispectral imaging allows Lumidigm sensors to capture superior images quickly, on all people, in all environmental conditions. The Mercury sensors incorporate this field-proven technology into a reliable new platform with a new form factor that supports speedy transactions with single-touch performance.